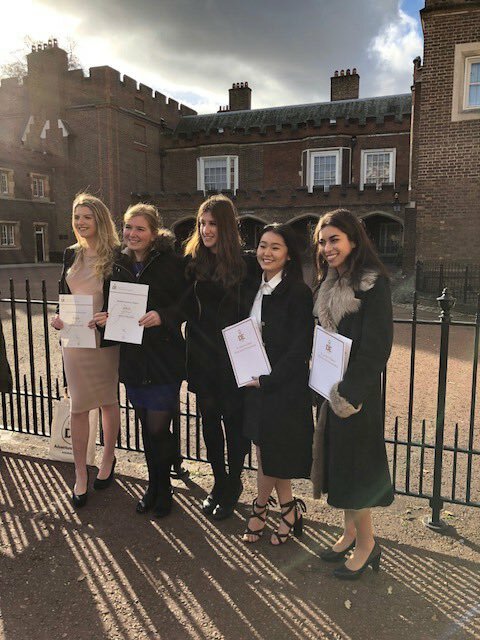 Five Former students - Victoria Cheung, Maria Christodoulou, Shiva Naser, Sophie Ware and Madeleine Webster - received their Gold Duke of Edinburgh Awards at St James's Palace this week. Mr Evans, Mrs Drew and proud parents took their places in the Throne Room to watch as the girls chatted with the Earl of Wessex about their Gold Expedition bell boating against the current on their river journey from Windsor to Oxford. Their certificates were presented by Roz Savage the only women to have rowed solo across the Atlantic, Pacific and Indian Oceans. Bromley's High's provision for the Duke of Edinburgh Award Scheme was praised as exemplary and Mrs Drew was presented with a framed certificate commemorating Bromley High's status as a Directly Licensed D of E Centre. Marisa Conner 16 years has had some great results recently competing in the Amsterdam International Diving Cup over Easter. There were divers from 11 countries including a number of National team divers taking part at this event. Marisa entered 1m and 3m springboard events in both girls 16-18 years as well as the Women’s category (for experience). Womens 1m springboard 8th place (7 points off qualifying for finals). Womens 3m springboard qualified for finals and finished 6th. Girls 16-18 years 1m springboard qualified for finals and finished 4th (3 points off bronze). Girls 16-18 years 3m springboard qualified for finals in 5th place and won Bronze medal in the finals. As a result of this exceptional diving Marisa achieved the required points on both 1m and 3m springboards needed to qualify for a place on the Dutch National Team. She now has to gain the required points again on either board at the Dutch Nationals in June to be officially selected to the team. Her plan is to then gain the points required to represent The Netherlands at International competition or Junior European Championships next year. Due to her great performance in Amsterdam the Head of Diving in the Netherlands has invited Marisa to compete in a competition in May which is exclusively for the Dutch National team divers. Meanwhile photo above (shows the height she now achieves on her dives from 3m). The winners of the 2016 ‘Young Geographers of the Year’ competition were announced on Friday 25 November, after answering the question ‘How is Britain changing? The awards were presented by Steve Brace FRGS, Head of Education and Outdoor Learning at the Society. Bromley High School is proud to announce that Danielle Allen-Chhokar, Lower Sixth, has won Highly Commended in her category. 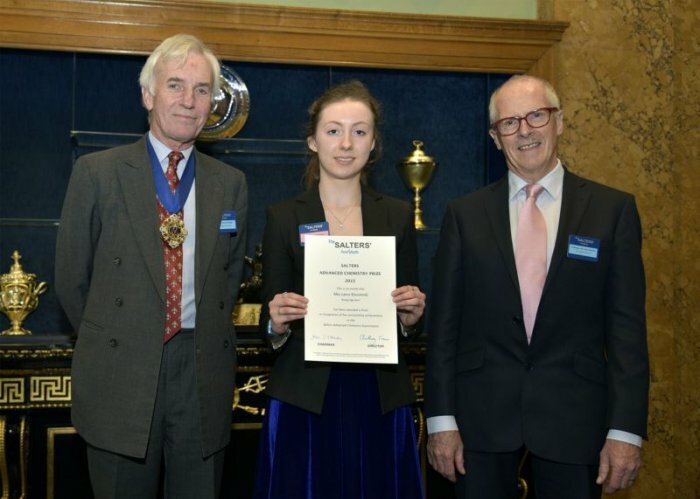 Danielle was presented with her Highly Commended award at the Royal Society by Steve Brace FRGS, Head of Education and Outdoor Learning at the Society. 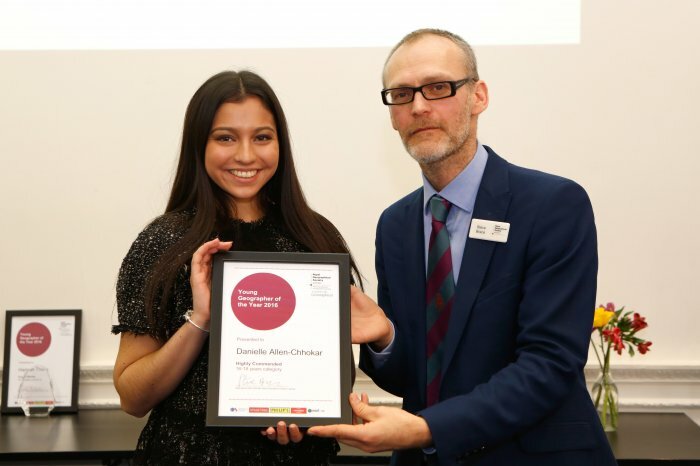 ‘Young Geographer of the Year’ is a national competition run by the Royal Geographical Society (with IBG) to encourage pupils to engage with geographical issues. Each year, the competition receives entries from thousands of pupils from hundreds of schools. 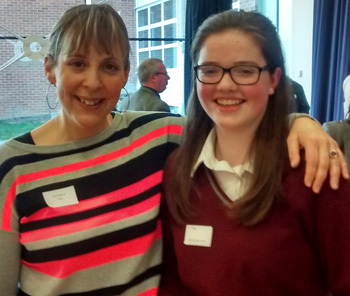 This year’s ‘Young Geographer of the Year’ competition was an opportunity for geography pupils to explore how Britain is changing. “This year students explored geographical change from many different perspectives. The Society’s Young Geographer of the Year competition recognises the best entries across four categories: Key Stage 2 (students aged 9-11); Key Stage 3 (11-14); Key Stage 4 or GCSE (14-16); and Key Stage 5 or A Level (16-18). Pupils in the first three categories were asked to submit an annotated diagram or poster, while A Level pupils were asked to submit a 1,500 word essay, which could include illustrations, maps or graphs. 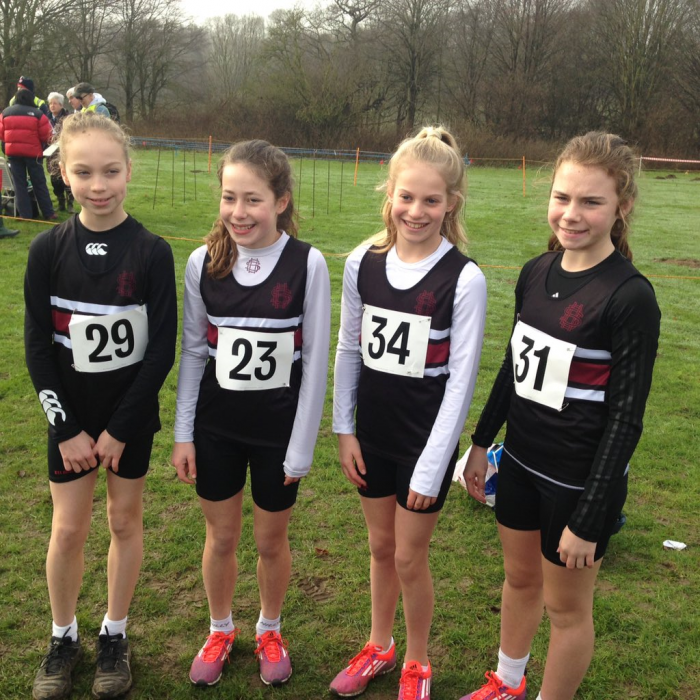 Representing Bromley Borough in the Kent Cross Country in Hythe on Saturday, our Year 7 team came 1st out the eleven Boroughs competing for Kent. We are really proud of this fantastic achievement. Bromley High School is best known for its outstanding academic reputation - this year's Upper Sixth hold offers for Oxford, Cambridge, Princeton and several medical schools - but its ethos is one of all round achievement. 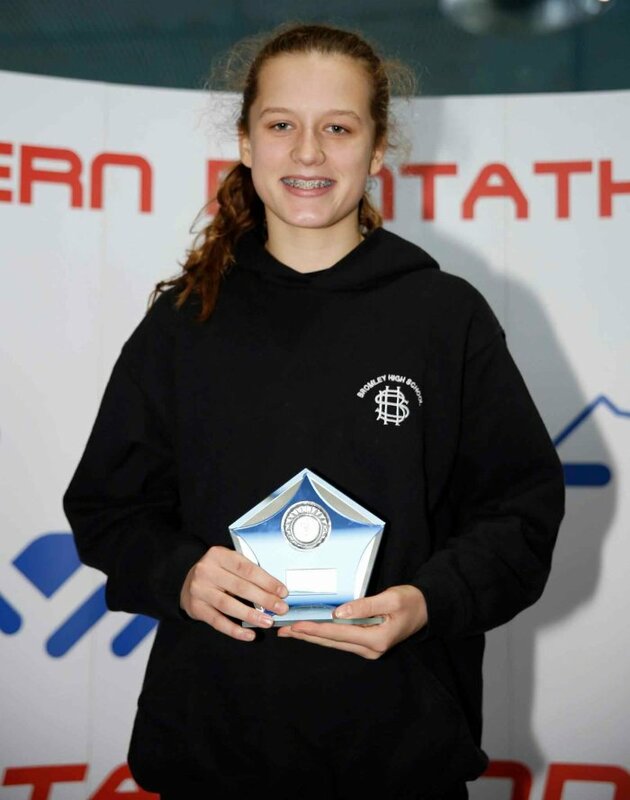 Little surprise, then that our athletes swept the board at the British Schools' Biathlon Championships at the Olympic Park this month with Bromley High girls placed 1st the U13 event, 2nd in the U16, and 3rd in U10 making this the fourth year in succession that a Bromley High girl has been a national biathlon champion. 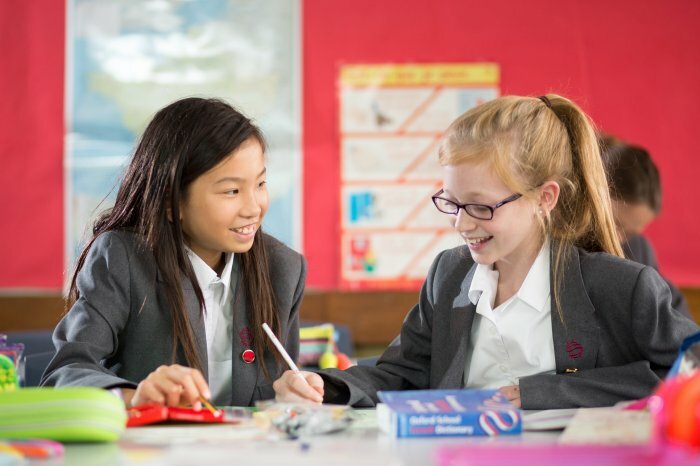 This term, girls have won national awards for public speaking and creative writing, our choirs have sung on the stages from the Queen Elizabeth Hall to Disneyland, from Paris to Leipzig. This is an expansive education: Easter, whilst the majority of our Y10 is out on D of E expedition in the English countryside, our Classicists are enjoying the delights of Italy, our Geographers the thrilling landscapes of Iceland and our World Challenge Team prepares for its expedition to Madagascar. 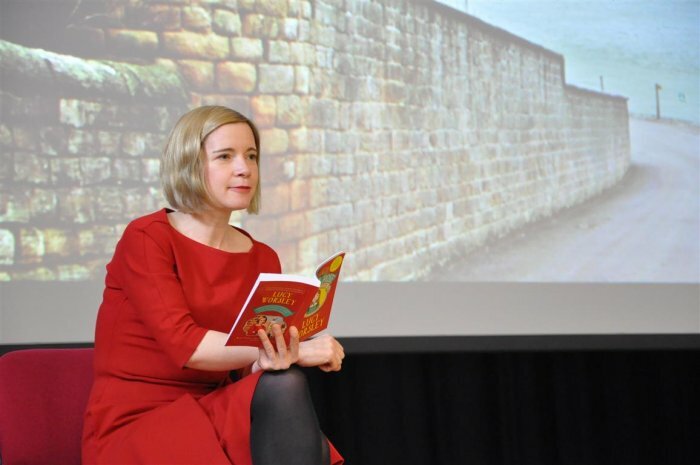 We were very lucky to have a return visit from successful TV historian and Curator of the Royal Palaces Lucy Worsley, who came to talk to Year 7 about the heroine of her new YA novel, “Lady Mary.” The daughter of Henry VIII and his first wife, Catherine of Aragon, Mary’s fortunes change dramatically when her father divorces her mother. The girls were engaged in an interactive Tudor history lesson, which included some of them acting out scenes from Mary’s life, including costumes and props. Although often overlooked by modern historians, Mary showed a dignity and courage in holding on to her beliefs that inspired her sister, the future Elizabeth I. Lucy was a delightful guest who once again got us thinking about historical issues whilst having a lot of fun. A group of Year 12 history students also sat in on the talk, and Lucy made time for a quick chat with them as well, which I’m sure made their day. “I really enjoyed taking part in the play, it helped us get into the story. Lucy also taught us lots about Hampton Court, where she works.” Alice Sanderson, 7F. At the beginning of the Autumn Term, Bromley High celebrated the arrival of our fleet of Steinway pianos. A year in the planning, this day has to have been one of the most anticipated and unsurpassed in the history of Bromley High Music Department. A team of Steinway movers and technicians skilfully negotiated the dining room to place all ten pianos, including the Concert Model D and Model B into the Senior School Hall. With pure excitement and joy our Junior and Senior pianists arrived to test out both their skills and the instruments, rehearsing two pieces which involved all pianos being played at the same time. At lunchtime we proudly presented our first ‘Steinway Concert’ to the rest of the school, which included some stunning solos from our music scholars. The pianos are now in situ in the music wing and the walls are literally buzzing with the sound of beautiful music. 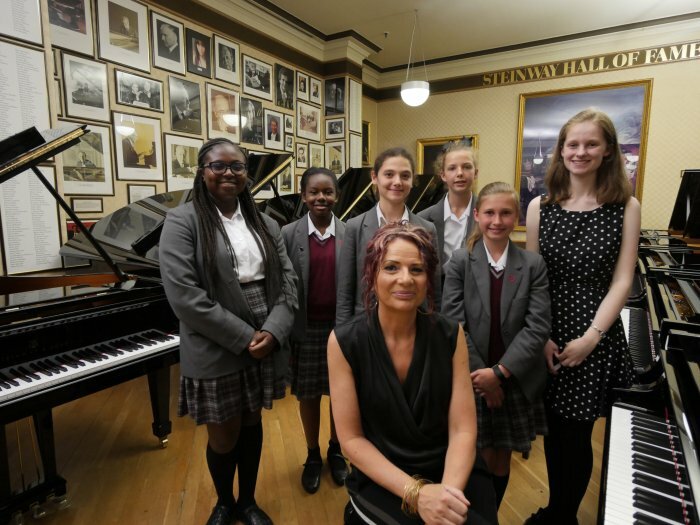 In the Summer, Bromley High Pupils were privileged to watch the Royal Academy of Music’s Head of Piano, Concert Pianist Joanna MacGregor OBE, select a Steinway Model D for the school at Steinway Hall in London. The selection involved Joanna, who is both a Steinway artist and an Alumna of a GDST School, playing on several exceptional pianos which had been shipped directly from the Steinway Factory in Hamburg. Steinway pianos are regarded as the finest in the world and their arrival at Bromley High in September will be marked by a special concert. 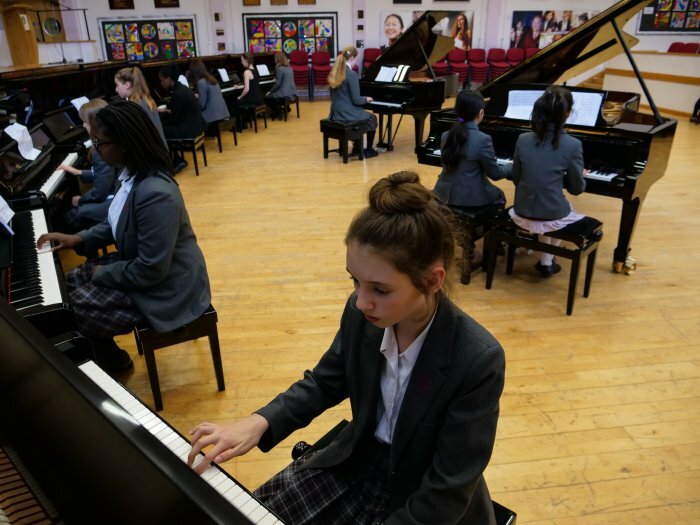 “Our educational philosophy values the creative arts very highly”, said Angela Drew, Headmistress of Bromley High School, “and we have demonstrated our commitment to the arts not only by investing in these beautiful instruments but in additional staffing to enable the Bromley High Music department to enhance the musical opportunities available to pupils in local primary schools”. 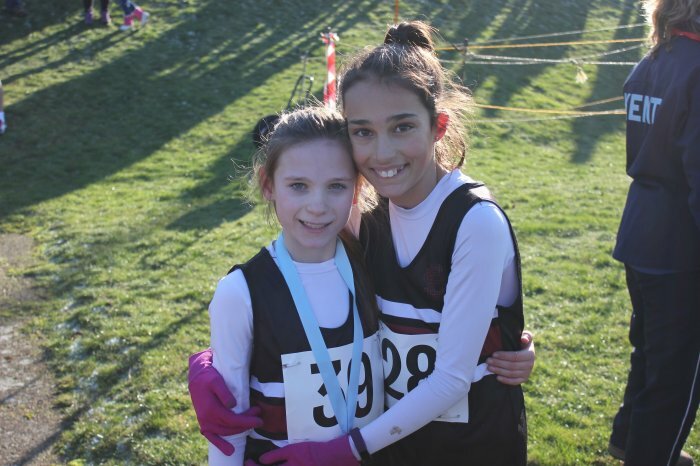 Huge congratulations to Lily who came 3rd and Hannah 20th in the Kent Schools Cross Country Championships in Dover on Saturday! A wonderful year for sport at Bromley High. A triumphant hockey season saw our U16s crowned outdoor and indoor Kent County Hockey Champions. 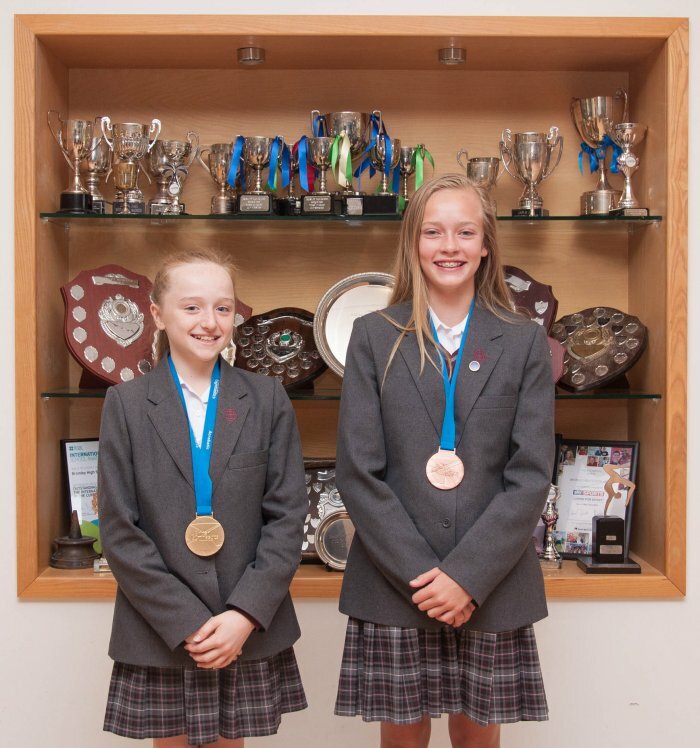 Girls gained national representative honours in diving, swimming, rowing, hockey, biathlon, gymnastics and tennis and girls in Years 7 to 10 won 25 county representative honours. The U11 Biathlon team was placed 2nd in the UK whilst a Bromley High girl won the individual U14 UK Biathlon Championships. Y7 and Y8 were Bromley Borough Athletics Champions. At the Kent County Athletics Championships, girls took Gold in 100 metres; Silver in High Jump; Bronze in Javelin. 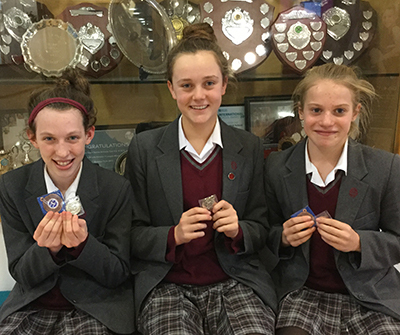 Six girls swam in the London Swimming Championships, with a haul of three Gold medals and three Silver. In the British Summer Nationals Imogen Meers won Silver in the 100m Freestyle and broke her own Kent record in winning a Bronze in 50m Backstroke. 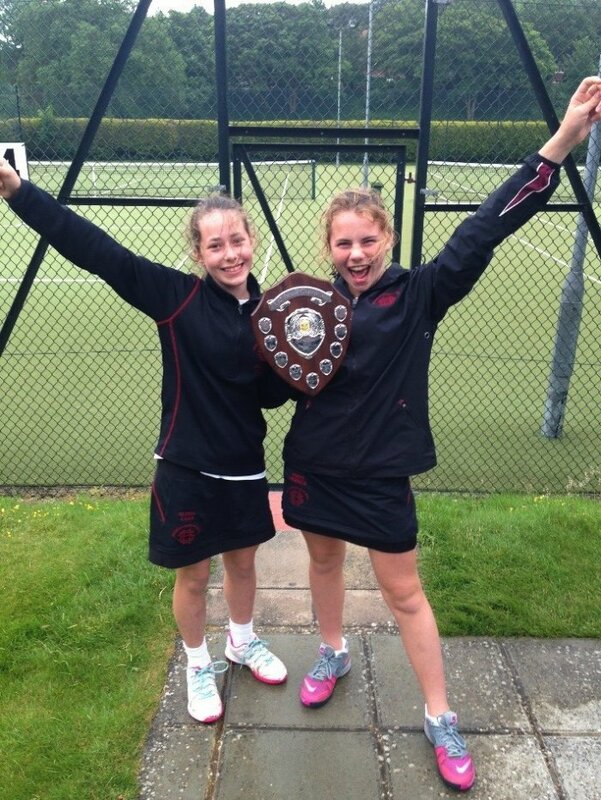 At the Kent County Tennis Doubles Championships Bromley High’s Junior pairs took First, Second and Third places while the U12s won the national Girls’ School Association Doubles Championship. Both Lois and Eloise Newberry represented Kent in the 9U South East Region County Cup helping Kent to win for the third successive year. Superb performances by our gymnasts at the British Gymnastic Championships in Liverpool saw Sophia Imrie-Gale with her partner Clyde Gembickas win Gold and crowned the new 11-16 mixed pair British Gymnastics Champions 2016, whilst Liberty Laurence (12 yrs) won Bronze in her category. We are delighted to announce U6th Leaver Laura Kruszewski has won a prestigious Salters’ Award for achieving the second highest mark in the UK in the recent Salters Advanced Chemistry Examination. Laura will receive her award in December at the Salters’ Institute Annual Awards Ceremony at Fishmongers’ Hall. Laura will receive her prize from Professor Sir John Holman. Three girls represented Bromley High School at the Kent Swimming Individual Championships in Thanet, Margate: Evelyn Davis (Y9), Annabel Smith (Y9) , and Lilly-Marie Derry (Y7). All three won Silver medals. Evelyn was 2nd in 100m Freestyle and 7th in the 100m Backstroke. Lilly-Marie was 2nd in the 11/12yrs 100m Backstroke and 4th in the 200m Individual Medley. 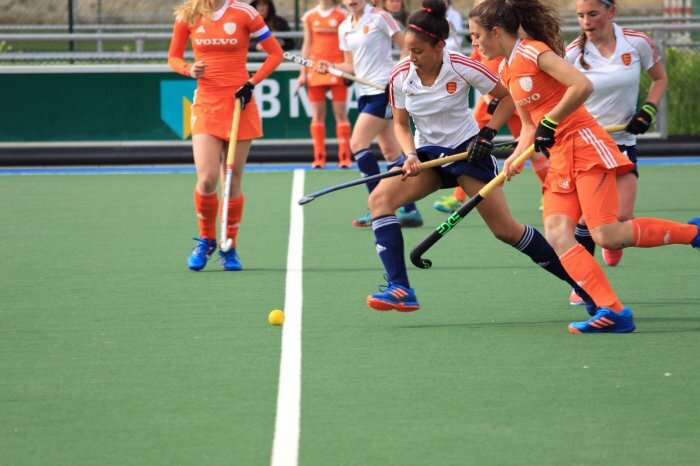 Renee has had a busy hockey season with successful trials and training camps for England leading to her gaining her first three caps over the Easter Holidays, in a series against Holland. As well as her GCSE’s this term she is also playing in a series against Ulster and then has the Six Nations in Spain in the summer. Well done to Renee and good luck in your next games. 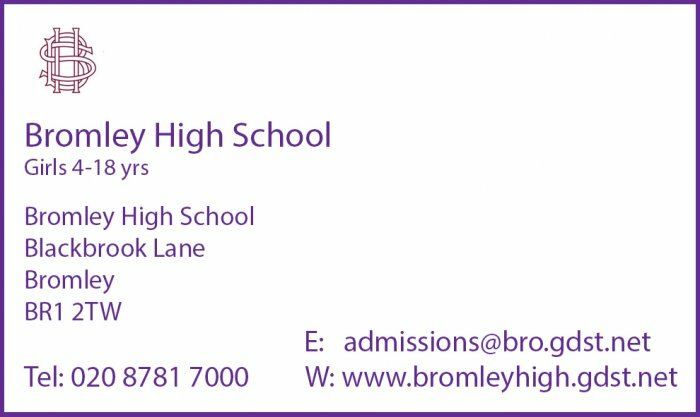 The outstanding achievement and learning at Bromley High School (recognised by the Independent Schools' Inspectorate with the rare accolade of an Exceptional grading) has never simply been a matter of consistently excellent academic results (85% A*-B at A level 2016; 88% A*-B 2015). Learning is rich, diverse, innovative, quirky and fun so the girls achieve as much outside the classroom as within it. Our Y8 Robotics team has just qualified for the National Finals of the VEX Robotics Championship; the Year 7 and 8 Chess came 7th in the South East U19 Competition; Danielle Allen-Chhokar in the Lower Sixth was Highly Commended in the National Geographic Young Geographer of the Year Competition; Priyanka Patel, Raveena Rao and Serena won the Finals in the London Region Heat of the English Speaking Union Debating Competition. 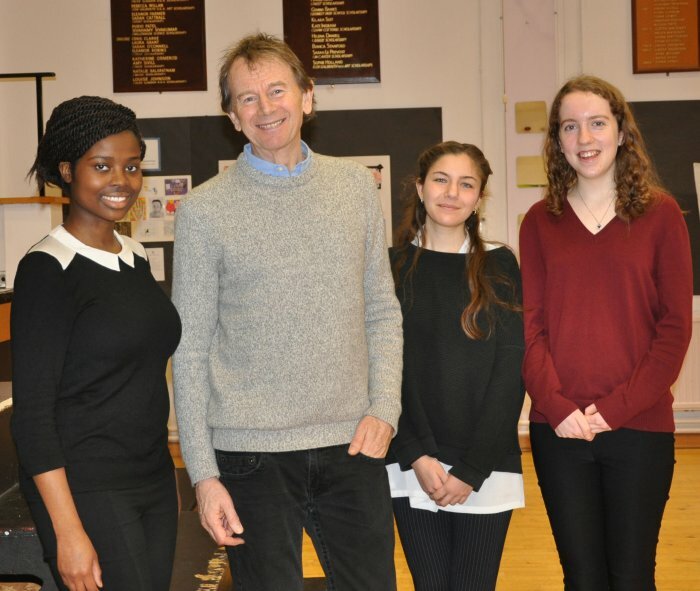 The extensive programme of inspirational speakers will continue to ensure that Bromley High girls think beyond the syllabus and outside the box - highlights this term include a lecture by distinguished TV Historian and Academic Michael Wood and the visit of Professor Edith Hall for an evening exploring the role of women in Classics. Lucy spoke to Year 7 about her role as Chief Curator of the Historic Palaces, and how her work at Hampton Court inspired her to write the book, ‘Eliza Rose’ which centres on Henry VIII and his marriage to the ill-fated Katherine Howard. Eliza Rose” tells the story of a young girl at the treacherous court of Henry VIII, where her cousin, Katherine Howard, becomes his fifth Queen. It will be published in April, but we were very lucky to have advance copies available. Lucy signed copies of 'Eliza Rose' for the girls too. The girls also got the chance to dress “Queen Katherine” in Tudor costume, which provoked much hilarity amongst those watching. The morning was rounded off with a picture quiz on Tudor artefacts, at which the girls proved surprisingly skilled, although the ear wax scraper proved rather challenging! As was guessing the content of the mystery parcel. It was a little red farthingale, or hooped skirt. Thank you Lucy for such a fantastic day. Year 10 were out and about on Tuesday to take part in the English Speaking Union prestigious public speaking competition. 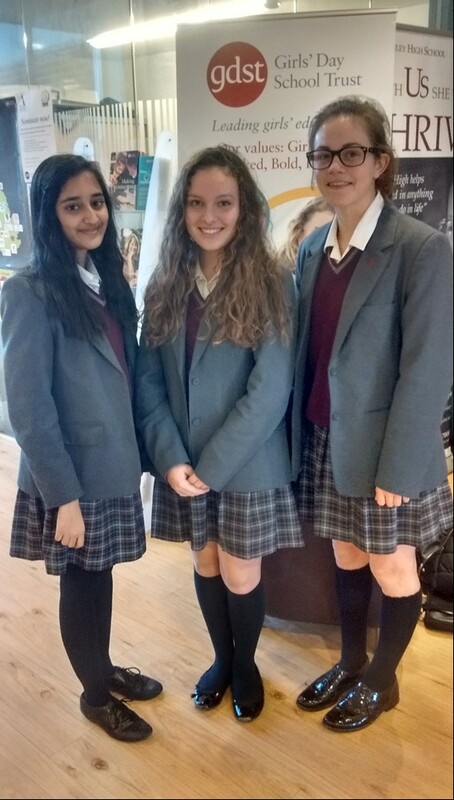 Held at Wallington High School, Serena Hunt (main speaker), Priyanka Patel (questioner) and Lilly Tuesley (chair) gave a presentation on the topic, ‘We should kill one to save many.’ Serena produced a thought provoking and philosophical speech that gained much prize from the principle judge on its wit and rigour. Both Serena and Priyanka also won best individual speaker and questioner with Lily a close second. The regional final will be held on 15th March at Dartford House in Central London.